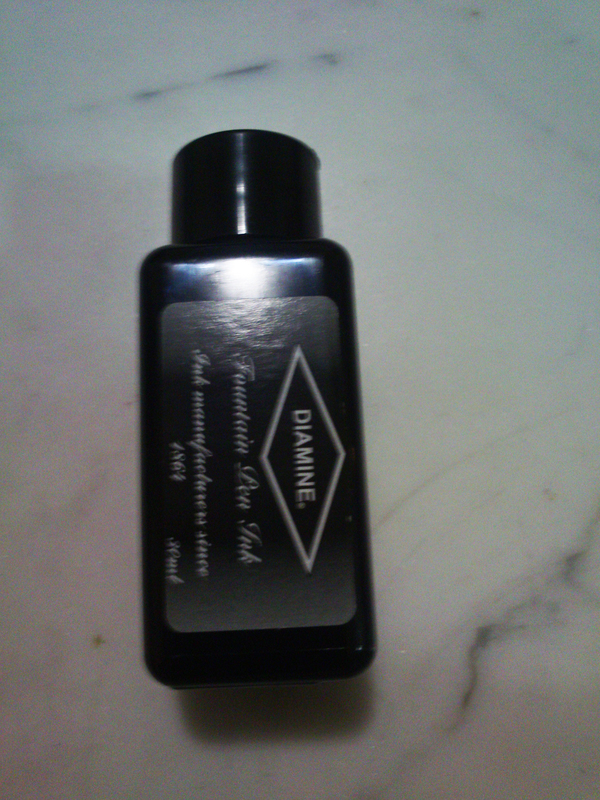 I bought the 30ml bottle. 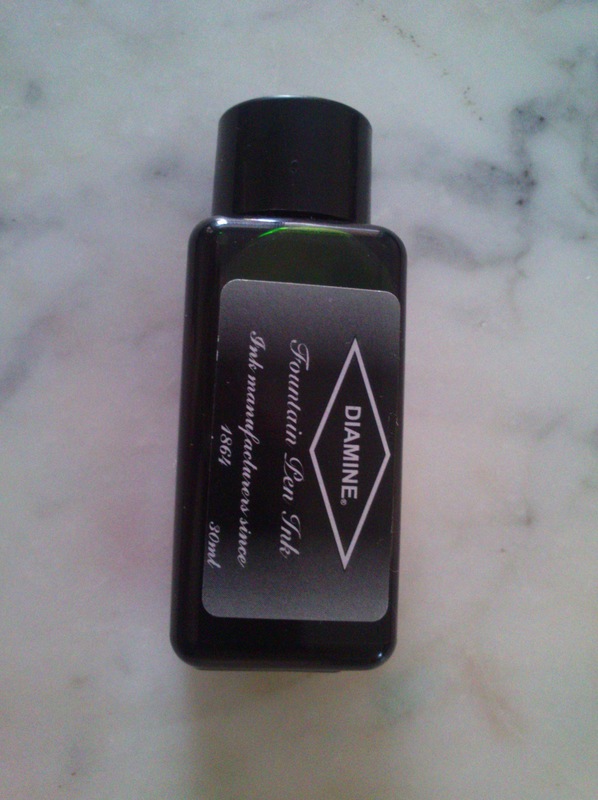 Diamine bottles are fairly basic, it’s a rectangle bottle made from plastic with a Diamine sticker on one side and a small silver sticker on the lid with the inks name. 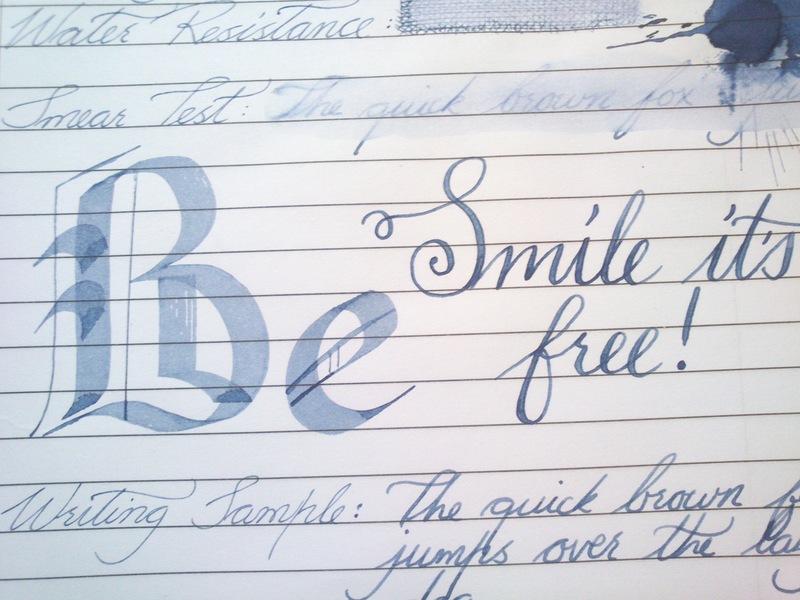 In general I tend to find blue inks a tad boring. 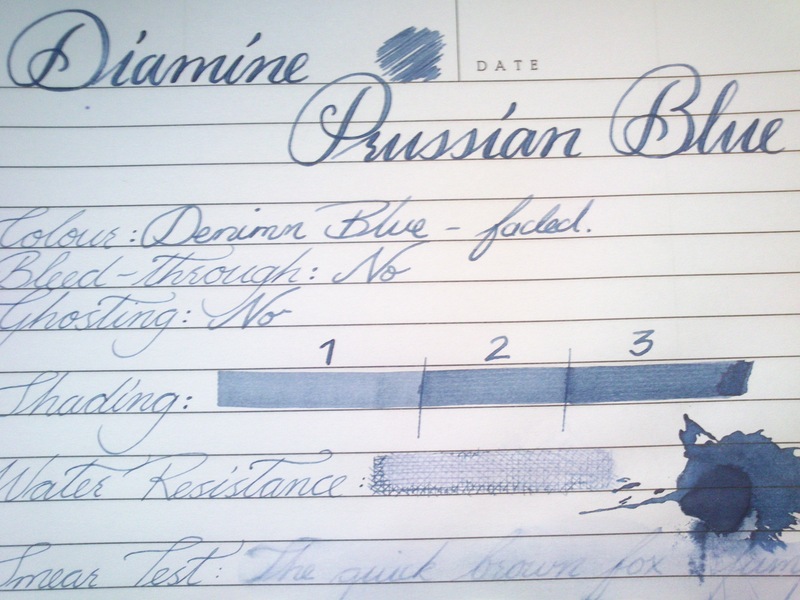 I know, I know shock and horror… but to be fair most of the blue ink samples/cartridges I have tried are flat, medium blues with very little shading and more importantly remind me of school. I didn’t dislike school – its just after 10 years of being forced to used the same colour, anything that reminds me of a blue ballpoint = monotony. 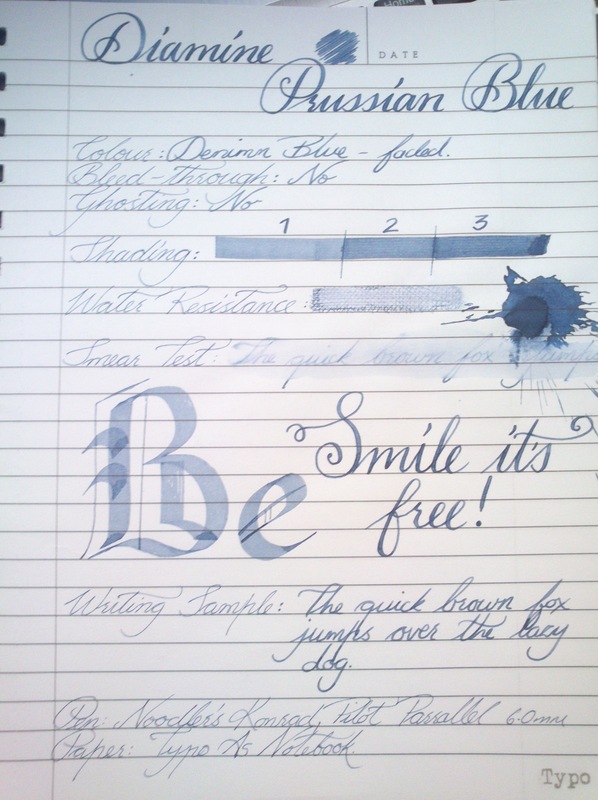 Even Noodlers Baystate Blue which most people rave about was eh for me. 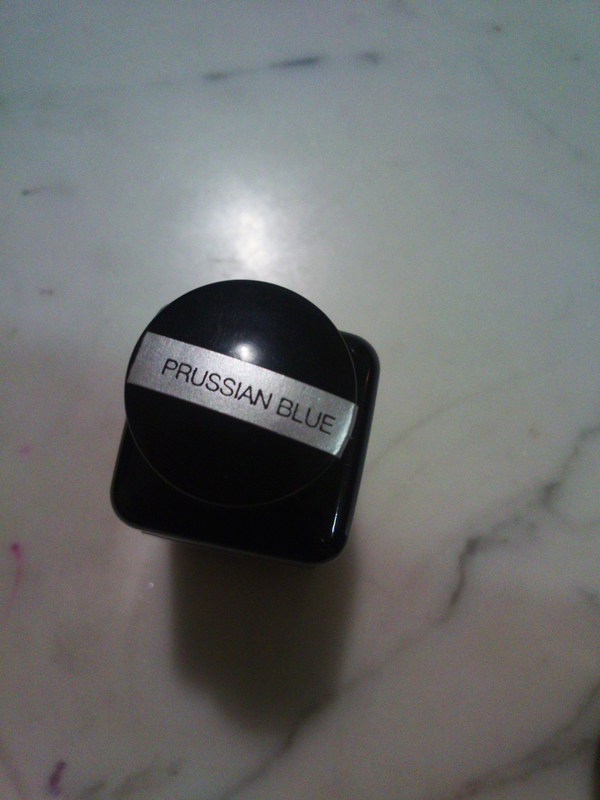 The colour reminds me of that pair of dark blue denims that most of us have had at some point in time. They have been washed so many time that they not really dark blue any more. They a faded muted blue but with hints of what the original colour used to be around the pockets and seams. Water resistance is not great – but there is enough left on the page to see what had been written. 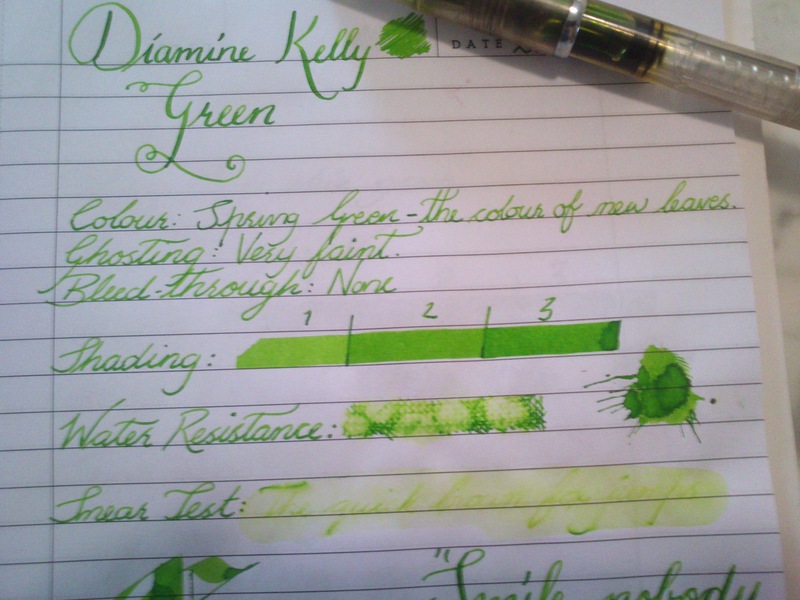 The ink kept up really well with my flex writing – much better then Diamine Kelly Green. 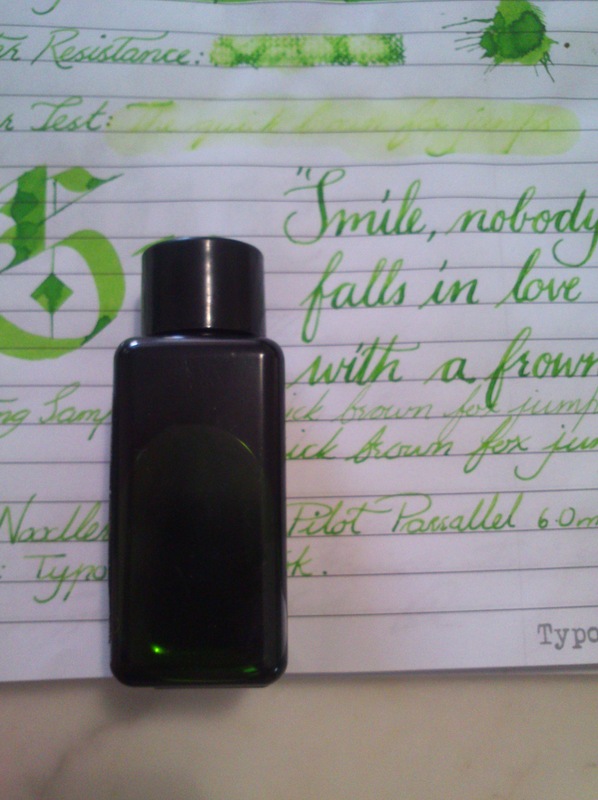 With the broad 6.0mm nib it also shows excellent colour variance. 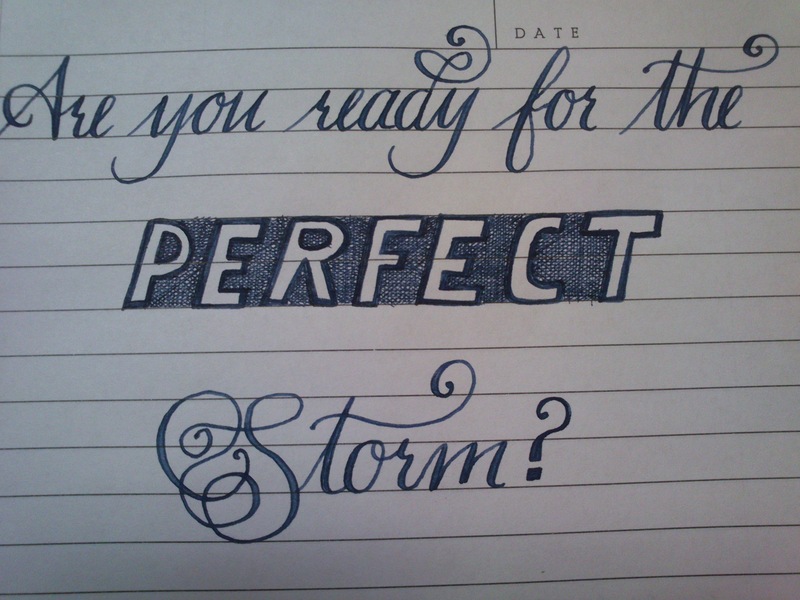 Ink makes me happy – and rainy days. Give me time to use my inks on a rainy day, with a good cup of coffee = bliss. 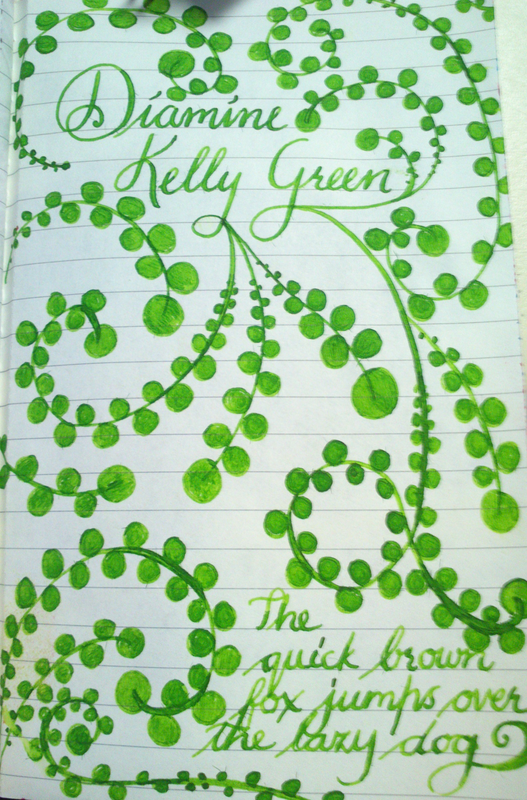 I finally got a chance to use Diamine Kelly Green, and the first thought that came to mind was ‘Spring’. This colour is identical to the new leaves that appear on trees when spring starts. 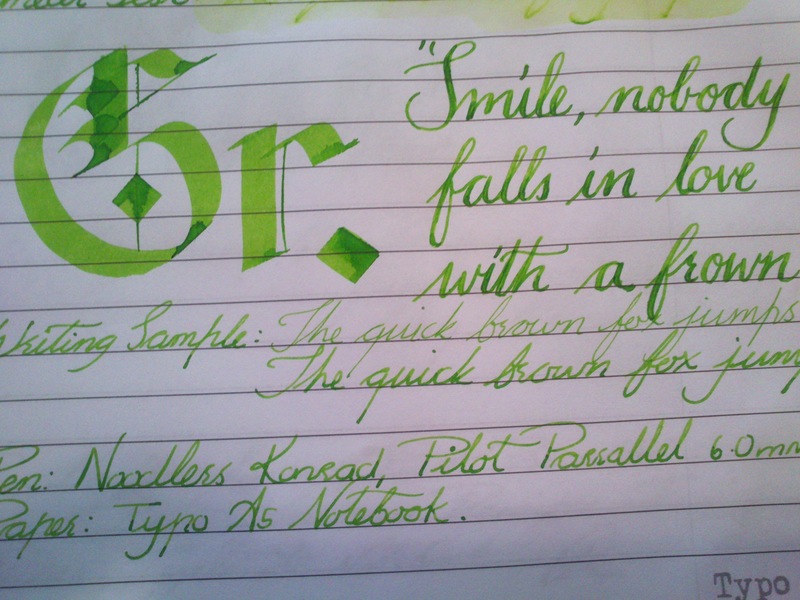 Its the sweet spot where the ink is perfectly legible and borderline neon, add amazing shading and i’m hooked. 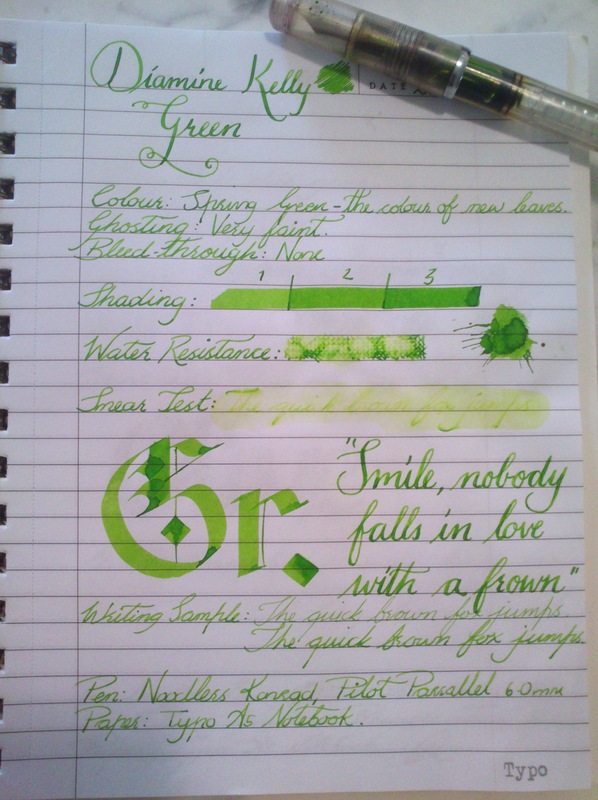 This ink gave me no flow issues with normal writing – but with my flex writing I had to slow down more than usual for the ink flow to keep up. There was very light feathering when using the Pilot Parallel 6.0mm and only in places where I had to go over more than once. Love the shading – water resistance, not so much. 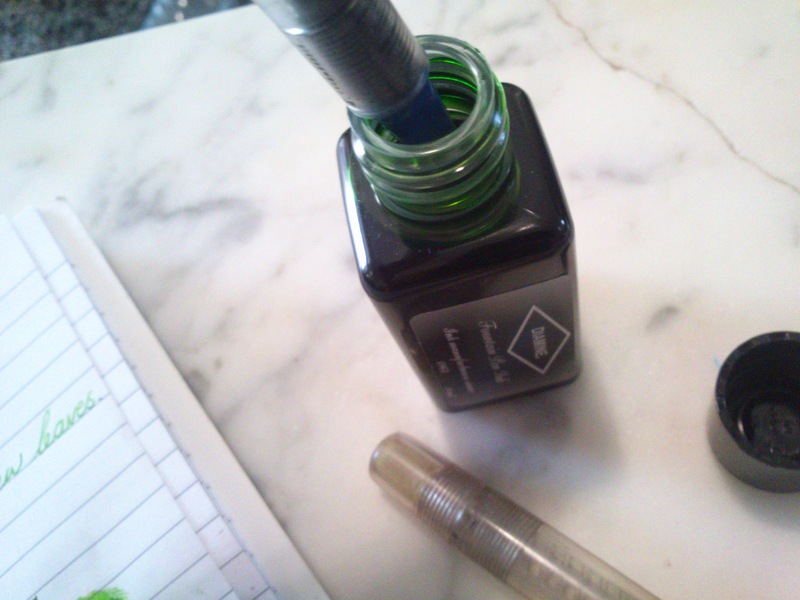 The bottle I have is the 30ml one, it’s ehh… But since Diamine is so reasonably priced you can’t really expect much from the bottle. The 30ml ink bottle is made from plastic – its a generic rectangle bottle with a Diamine sticker on one side, and a tiny silver sticker strip on top of the lid letting you know what colour is in the bottle. The only true design flaw for me, is the fact that the small size of the bottle opening will make it very difficult to fill a pen once the ink level starts to get low. A very easy fix is to just decant some into a vial and fill it from there – so not a huge issue. I was a little shocked how small the bottle actually is (yes I know it says 30ml k – don’t judge)… images always make things look bigger. So here is an image with the bottle against the paper line grid – you should be able to get a size reference using any standard lined writing pad.